The artist rendering for the engravers to follow when cutting dies for the coins. (we are aware of, and have corrected the Typo in Mårten Eskil Winge’s name). 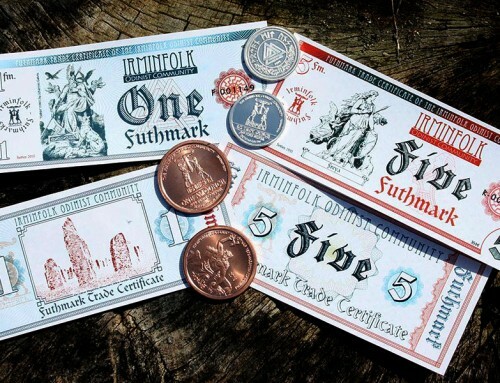 As one of our cornerstone tools of community empowerment, raising awareness of Odinism, and promoting a barter economy, the Irminfolk is rolling out its own alternative community currency. As far as we can tell, this is the first time an Asatru group has issued its own currency. It is a major step toward the establishment of a strong folk-community. Not much else says “Established Community” like a currency program. We are launching this project with several facets in mind: As a collectible medallion series; as a means of investing in precious metals; as a fundraising measure for the Irminfolk; and as a means of allowing valuable exchanges among people. This physical metal medallion program is a voluntary system of barter and exchange that acts as a complimentary community currency. It does not compete with or replace the US Dollar at all. We will vend these coins at our event and online through our store; in turn we will offer discounts and incentives to people who use them to trade for our goods and services. The “Value” of each coin is subject to negotiation if both parties so choose, but a suggested value is set for each different medallion to standardize trades. 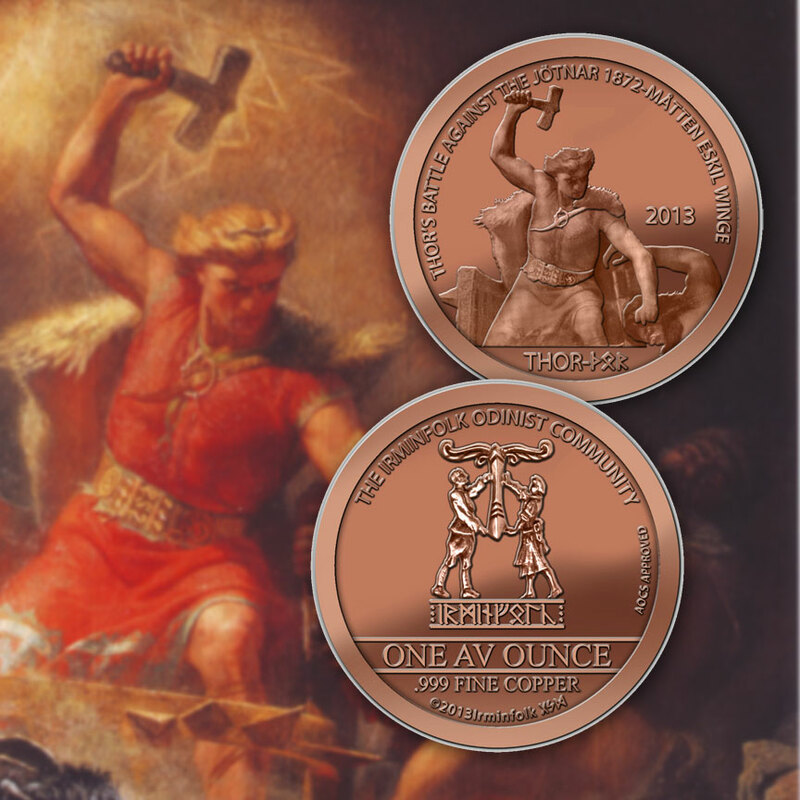 The first coins in the series will be .999 pure copper 1 ounce coins featuring Thor on the obverse and the Irminfolk Logo on the reverse, along with information about the purity, metal content, and weight of the coin. Future coins will be minted in Silver ounces, Half ounces, Quarter ounces, Tenth Ounces and Copper Half ounces and these will facilitate different fractions of amounts to be exchanged. Proposed artwork is to include Odin, A Black Sun, and a Thor’s Hammer. Later, after these designs are circulated, we may decide to branch out into other Pre-Christian European Pantheons which will include Swentovit and Mars among our designs. On the drawing board is the possibility of having the entire FUTHARK minted simultaneously as a complete set. 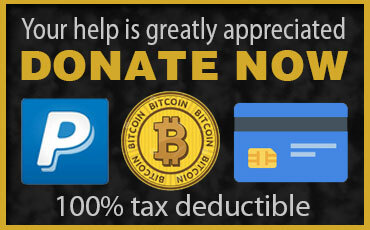 These coins will be a major contributor to our fundraising efforts as a community. 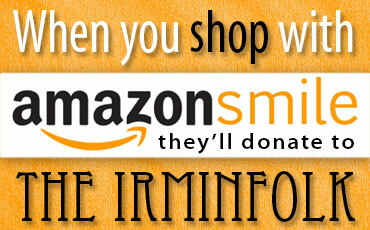 Specifically this is intended to be a major fundraiser for Project Irminshire. Each coin that is used in a transaction with the Irminfolk will actually benefit both the Community (in more ways than one) and the person trading the medallion. When the Irminfolk vends a coin, it makes a very modest profit, and when that coin is traded for a good or service we offer, it is at a discount. You win, we win, and the Community at large wins. Also, it is expected that many of these coins will be taken out of circulation by collectors (numismatists) and metal hoarders. This is great for us, each time we have to replace coins that disappear from circulation, we generate a little more revenue for our projects. 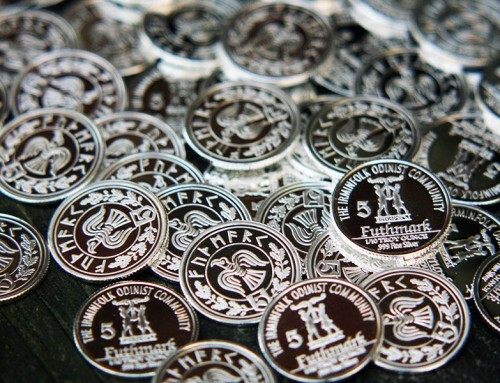 In addition to a financial benefit, there are other fringe benefits to these coins as well. They are excellent advertisements; raising awareness for Odinism in General, The Irminfolk’s ability to create a thriving Community in particular and as a bonus, they raise awareness of alternative currencies. Since we are investing heavily in the alternative currency movement with this initiative, the more exposure the better. Federal Reserve Notes, which are not a store of wealth – but evidence of debt, are forced on the people by law. As such, even when the money becomes debased, inflated and counterfeited, the people have no say in whether they want to accept it or not. 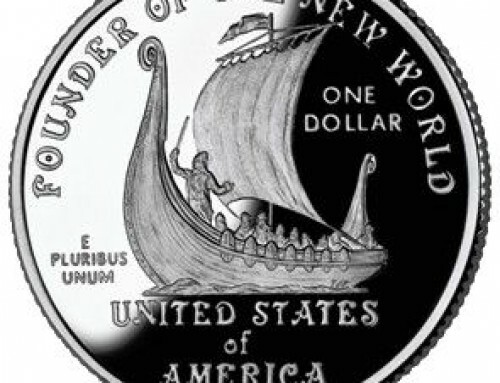 The Irminfolk coin (and all “real money” alternative currency) is not susceptible to these problems because it is a completely voluntary barter medallion that is in and of itself valuable. If the coins became debased, or inflated somehow, then people can just choose not to trade in them. Such schemes that have devalued the US dollar in the past century simply cannot succeed with a currency system based on a real commodity. The Irminfolk coins are compliant within the standards of the American Open Currency Standard (AOCS) and as such are comparable with all other alternative currency markets that use the AOCS standard. The AOCS guarantees the standard of Weight and Purity for every medallion minted and establishes an equitable rate of exchange between gold, silver, copper and fiat currencies. 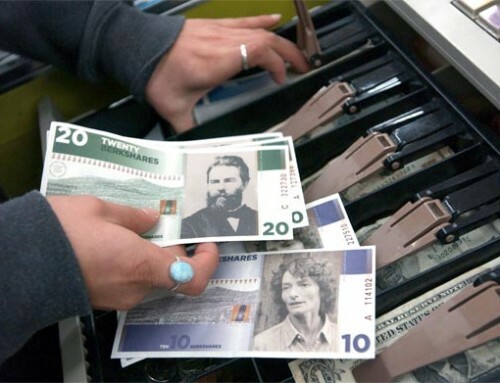 This means that the Irminfolk will enjoy full interchangeability with any other alternative currency that bears the mark “AOCS APPROVED” at the going exchange rate. You will be able to deposit silver Odin coins at the Free Lakota Bank for example. Update February 28, 2013: The dies are currently being cut. We opted for an upgraded (and slightly more expensive) die cutting option that will provide better results. 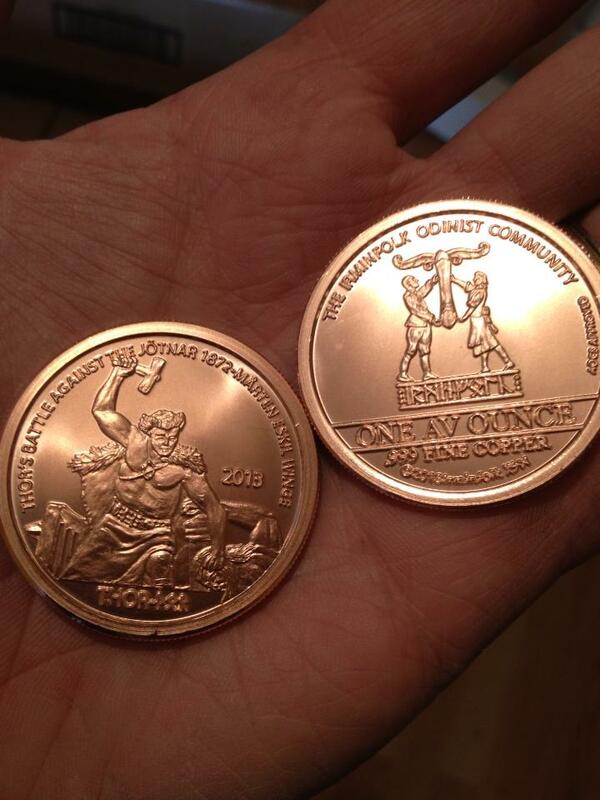 We hope to be taking possession of these coins in the next 3 weeks.